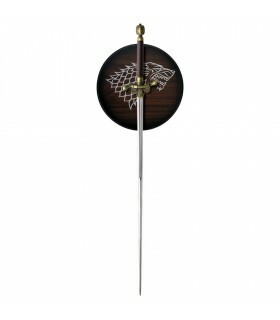 Swords a Game of Thrones There are 4 products. 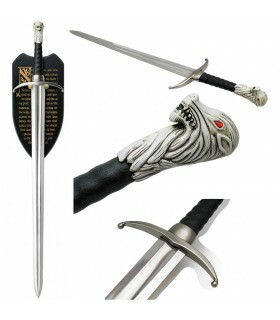 Ice Original Sword by Eddard Stark from the Game of Thrones® Collection. The authentic, the original. Made with 1060 high carbon steel blade and wooden handle with aged brass handle pieces. Includes screen-printed wooden plate. Game of Thrones is a TV serie based on a series of fantasy novels called song of ice and fire written by George R.R Martin, whose number is currently seven, which takes place on the fictional continents of Westeros and Essos. He is the illegitimate son of Ned Stark, Lord of Winterfell. His last name is very common among illegitimate sons. In the TV Series we will see him as a brave and loyal young man, who decides to leave Winterfell because he does not considier himself as a true Stark. His sword is 107 cms long and its blade is 87, its handle is made of leather and and we can see a wolf head in its knob. He is the Lord of Winterfell and the King in the North. In TV series, but also in book, he will be shown as a duty-bound an hounourable man, the main reason beacuse he will be chosen as King's Hand by a former friend, Robert Baratheon, Lord of the Seven Kingdoms. 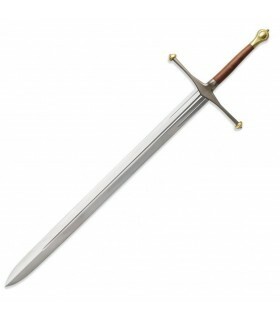 This sword is 146 cms long and and its blade is 106.5 cms. 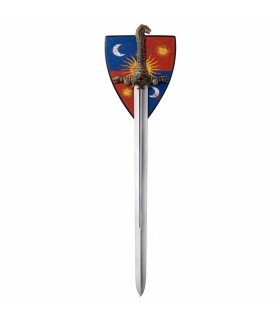 We have available the Jon Snow and Eddard Stark's swords, original, real and with its authenticity certificates. If you see them in stock and you purchase them we will ship them immediately.